What will happen at the judiciary now? 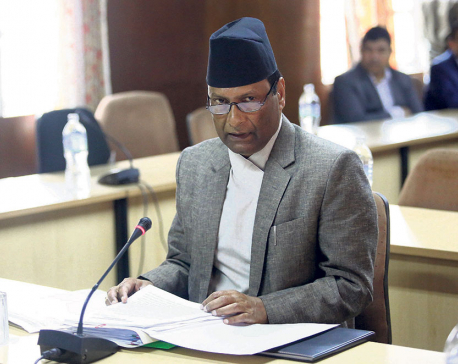 KATHMANDU, Aug 4: Serious constitutional questions have arisen following the rejection of chief justice nominee Deepak Raj Joshee by the Parliamentary Hearings Committee (PHC) on Friday. The question has risen whether or not Joshee will now automatically lose his position as seniormost justice of the apex court. If he continues as seniormost justice, what will happen to his parliamentary rejection as the PHC has already made various allegations against him without proper study, such as possession of dodgy academic certificates and failure to show competence to perform as a justice of the Supreme Court. He has also been facing allegations of not controlling corruption in the judiciary. “Joshee’s position as seniormost justice cannot be vacated automatically with his parliamentary rejection as CJ,” former Supreme Court justice Balaram KC told Republica. “This is not clearly spelled out in any article of the constitution. Therefore he can continue as second man in the judiciary.” According to sources associated with Joshee, consultations over this matter are ongoing and he most probably would not resign as seniormost justice. Article 292 (2) of the constitution provisions the holding of parliamentary hearings prior to making various appointments, including chief justice, but the requisite law has not been enacted. Consequently, some procedural and substantive questions remain unresolved. “He can continue as seniormost justice and if an impeachment motion is lodged against Joshee on the same grounds cited for his disqualification as CJ, it would constitute a kind of political vendetta. And this could be a matter for judicial review by the apex court,” KC added. KC also underlined that if Joshee had any misgivings over the hearings he should have asked for a proper probe into his certificates before the hearings took place. Joshee did not do so and neither did the hearings committee investigate his certificates or any other allegations. In his capacity as seniormost justice Joshee would be chairman of the Judicial Council and an ex-officio member of the Constitutional Council. So the smooth functioning of these bodies may be compromised. The meetings of the JC and the Constitutional Council may suffer if he does not cooperate. According to him, the PHC should have resolved any misgivings through proper investigations into Joshee’s academic credentials, his conduct and his capacity for work. According to Article 204 (1) of the Constitution, a parliamentary rule would be taken as temporary legislation until the enactment of the relevant legislation. Proper inquiries on the basis thereof are expected before any major decision is taken.